Using this plugin you can accept payments from all over the world for your e-commerce store. WordPress WooCommerce Marketplace Stripe Connect works as a payment gateway. This Plugin can be run in both test and live mode. In this seller has to connect using stripe connect. WordPress WooCommerce Marketplace Stripe Connect Plugin is an add-on of WordPress WooCommerce Multi Vendor Marketplace Plugin. To use this plugin you must have installed first WordPress WooCommerce Multi Vendor Marketplace Plugin. Better Security as given by Oauth (Open standard for authorization). For creating token when receiving card details, so that no information of card could be received by our own server. Email notification of the transaction. Support for almost all kind of cards including Visa, Mastercard, American Express & Discover. Well integrated with WordPress WooCommerce Marketplace. The customer makes a payment for the product/s, the payment is automatically split amongst the admin and the sellers involved. The customer can save the billing address for future use. Step 1: Go to https://dashboard.stripe.com/login and enter your login details. Step 2: Now, enable the option “View test data” on the side panel if not enabled already. Step 3: Click the API menu option on the side panel to see the Publishable key(API Publishable Key). Now, click the “Reveal test key token” to get your Secret Key(API Key). Clicking the “Reveal test key token” will bring up the – Secret Key(API Key). Step 4: To get the Client Secret key click the “Connect” menu option on the side panel and then click on the “Settings” option. Enter all the required information for the application. Development mode – This client_id is to be used when your site is in the testing mode. Product mode – This client_id is to be used when your site is in the live mode. 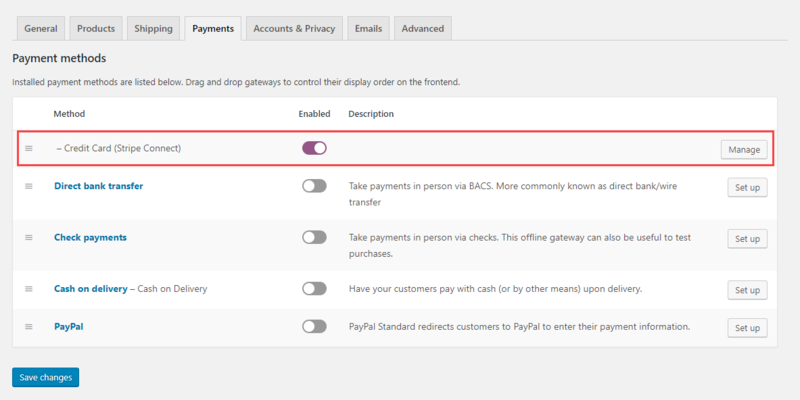 After successful installation of Stripe Connect the admin can configure this under “WooCommerce > Settings > Payments”. 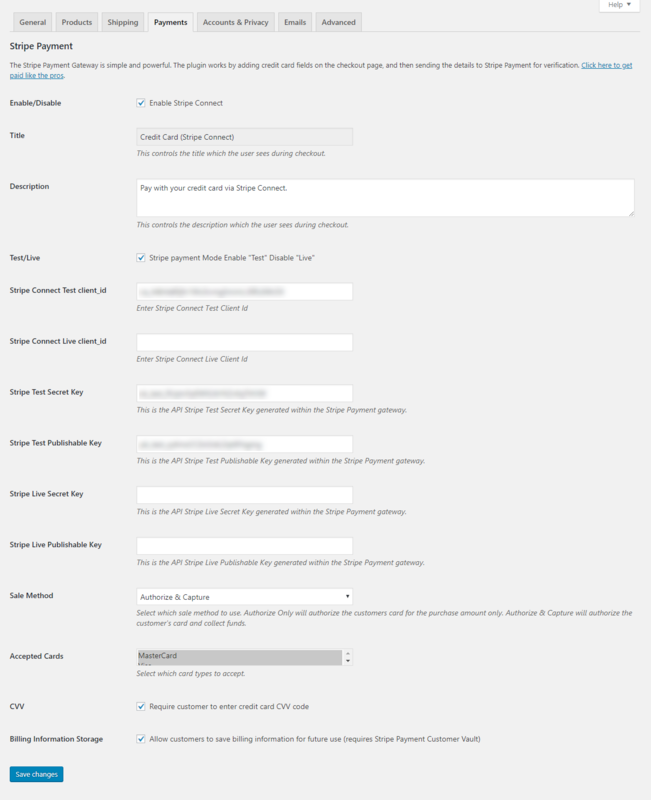 Here admin can enable the Credit Cart (Stripe Connect) payment method and can configure it by clicking “Manage”. Enable/Disable – With the help of this option the admin can enable or disable this plugin. Title – Enter the title which will be displayed at the time of checkout. Description – Enter description will be displayed to the user during checkout. Test/Live – Here the admin can opt for the test or the live mode of this payment method. Stripe Connect Test client_id – Enter Stripe Connect Test Client Id. Stripe Connect Live client_id – Enter Stripe Connect Live Client Id. Stripe Test Secret Key – Enter the API Stripe Test Secret Key generated within the Stripe Payment gateway. Stripe Test Publishable Key – Enter the API Stripe Test Publishable Key generated within the Stripe Payment gateway. Stripe Live Secret Key – Enter the API Stripe Live Secret Key generated within the Stripe Payment gateway. Stripe Live Publishable Key – Enter the API Stripe Live Publishable Key generated within the Stripe Payment gateway. Sale Method – Select which sale method to use. Authorize Only will authorize the customer’s card for the purchase amount only. Authorize & Capture will authorize the customer’s card and collect funds. Accepted Cards – Select which card types to accept from “MasterCard”, “Visa”, “Discover”, and “American Express”. CVV – Enable if require customer to enter credit card CVV code. After entering all the required details click “Save Changes” to save the save the details. Login as a Seller, then go through the Seller Panel menu option “My Profile” as shown below in the snapshot. After that go to “Payment Information” section and then click on the “Connect With Stripe” button to connect to the admin via stripe connect as shown below in the snapshot. By clicking the “Connect With Stripe” button, you will be redirected to another page, where you will have to fill in some details. After filling in the details click the “Authorize Access To This Account” to get the “Payment Description Or Payment Id“. Now you will be redirected to the “My profile” page and can find the Payment Id, click the update button to save the configuration. At the checkout, the buyer will see this Stripe Connect payment method available for making the purchase. 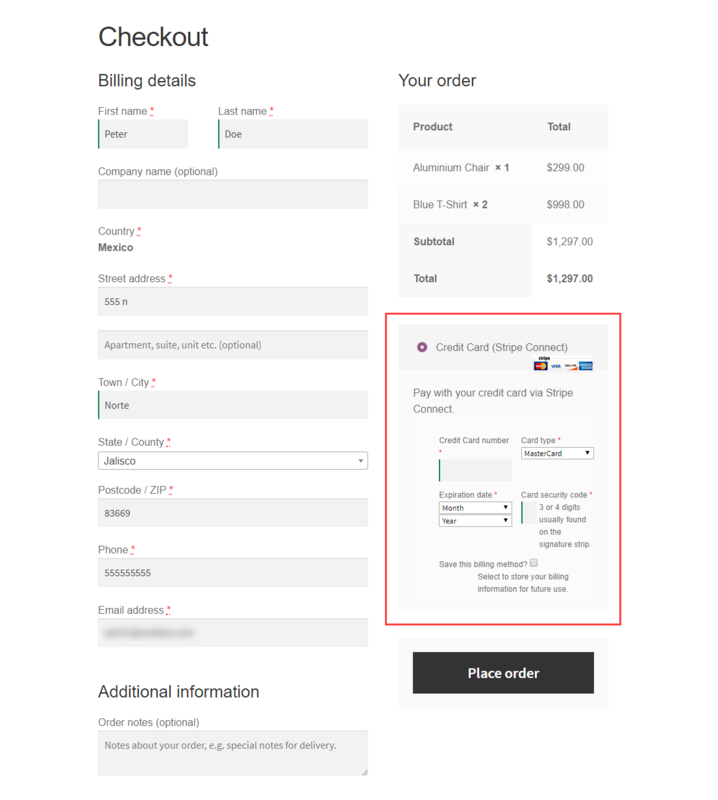 The buyer will select the Credit Card (Stripe Connect) method to use their credit card. Customers can select the card type as – Master, Visa, Discover or American Express as per the requirement. 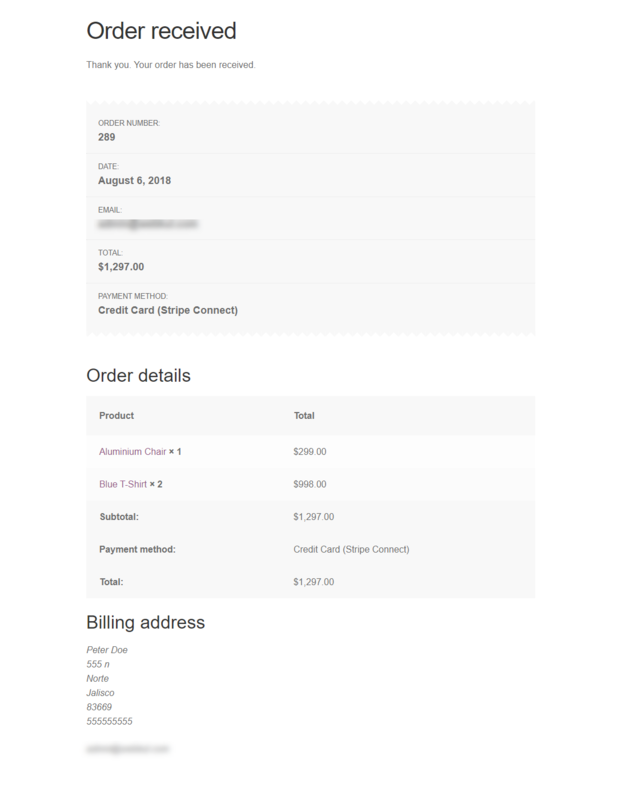 After placing the order, the customer will see the Order Received confirmation and can see the Order number, Date, Total Amount Paid, Payment method selected and other order details as shown below in the snapshot.